Celtic Jewellery - I & RFB Silversmith is based in Doolin, County Clare, on the west coast of Ireland. Inge and Robert make traditional and contemporary silver jewellery inspired by old Celtic patterns. 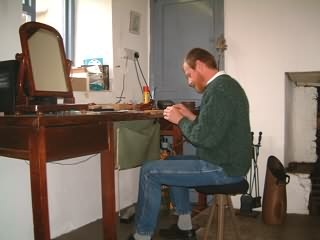 Robert qualified as a Silversmith in 1980 and started making Celtic Jewellery in Doolin in 1984. In 1989 he opened his Celtic Jewellery shop and workshop in Fisherstreet, Doolin. Inge joined 1994. 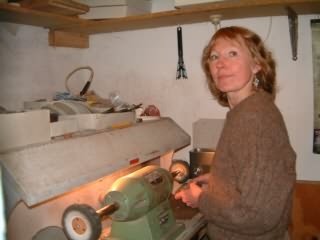 She has designed a jewellery collection in her own style, as well as Celtic drawings and cards. but we continue selling our Celtic Jewellery through our website. But don't let that stop you from having a browse through our jewellery. There are two jewellery pages named Showcase 1 and 2. Just click any of the buttons below. Click on the showcases to view our Celtic Jewellery selection. while Showcase 2 offers you jewellery in a more contemporary Celtic style. We hope you enjoy our website. Its aim was not only to promote our Celtic Jewellery, but also to help you plan your holidays in Doolin. We still feel that Doolin is one of the most beautiful places on earth. You may not find this so obvious if you are just stopping in Doolin for lunch as part of your Burren daytrip. 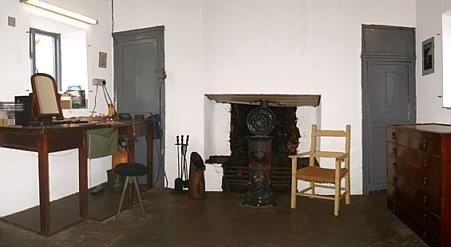 But if you decide to stay for at least a few days and you like the sea, the rugged coastline, the Irish music and meeting people from around the world and locally, you'll love it here. We wish you a wonderful experience on your stay in Doolin! We only sell directly to the public from our Celtic Jewellery website. We do not have a catalogue and we do not wholesale our Celtic Jewellery. I & RFB Silversmith have a strict no spam policy. sent maliciously by unknown parties, some of them containing viruses. There is only one way to be safe. with the sender that the attachment is safe and it was sent by that person. That is the only real protection you have at this stage. Even up to date Anti Virus protection may fail to detect a newly released virus.